In this post, we talk about one of the most powerful features of Google Analytics: Goals. Goals are how you tell Google Analytics what actions, behaviors or outcomes matter most on your website; they’re your opportunity to teach GA to recognize what your business truly cares about. Goals can be really powerful, but their setup can be a bit tricky. Before you can set up goals on site, you need to come up with a plan. What’s the primary objective of my website? Is it… Sign ups? Sales? Newsletter sign ups? Ad clicks? Stickiness? What key actions support this goal? Creating an account? Adding a product to a shopping cart? Visiting the pricing page? Other? What are the other goals of my website? Maybe your main objective is to sell products, but you’d also like to get newsletter sign ups? 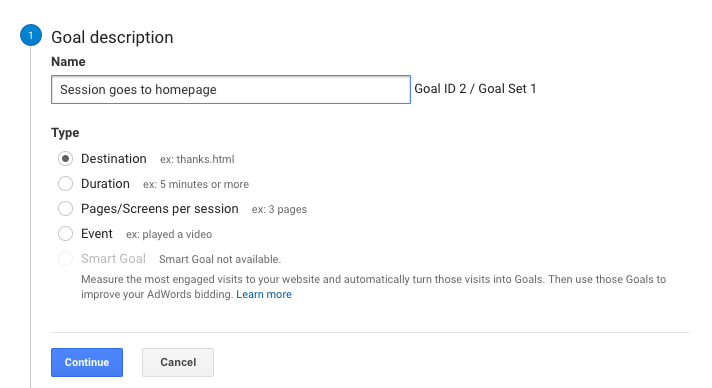 Goal creation in Google Analytics can be quick and easy, but since goals cannot be deleted — they can be turned off, edited, but not deleted — and you only get 20 Goals per View, it’s best to plan ahead. For us at Highlights, the primary objective of our website is sign ups. Actions supporting sign up include viewing our landing page (the homepage 📃), our sign up page, and sometimes, our pricing page. If people are not ready to sign up, but interested in growth, we’re very happy to have them sign up to our newsletter, our secondary objective. Events: Actions performed by visitors or users on a page — like playing a video or clicking a link — tracked using Google Analytics’ Event Tracking. Destination: Specific page (URL) visited on your website like a purchase confirmation screen or a thank you page. Duration: The amount of time a user spends on your website during his/her visit. This option can be really useful for news and content sites. 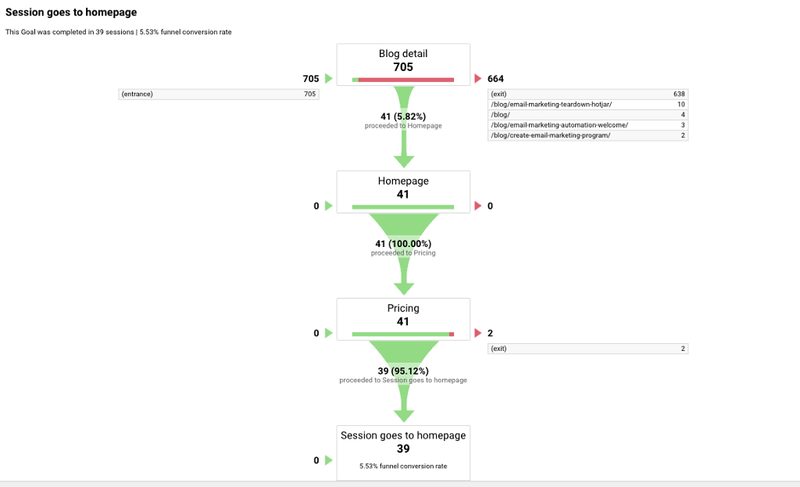 Pages/Screens per Session: Similarly, you can create Goals for the number of pages visited during a session. This can be particularly useful when analyzing a multi-page funnel like a checkout process. You can match your site or business objectives to these mechanics. For example, we use ‘Destination’ for our primary objective (Sign ups). Since Goals are tied to Google Analytics Views, it’s important for your View to include all the pages you need. For example, we use the first screen users view in our app as our destination URL (/onboarding/google-analytics). We’re able to track Goals across the website and our app because our Google Analytics setup permits it. From there, click ‘+ NEW GOAL’ and write a clear name for your Goal (e.g. Sign Up). You want to make sure it’s easy to retrieve and use that Goal across Google Analytics reports. Google Analytics may suggest to use Goal templates (e.g. Create an account, See deals, etc) that will give you pre-filled configurations. The process below is based on the Custom template, which we strongly recommend. Be careful with the different operators (Equals to, Begins with and Regular expression). Selecting the wrong parameters can lead to false positives. You can use these examples from Google as reference. You can set a Goal value (e.g. the price of a course, a plan, a product, etc) to give greater priority to your primary goal. We’ll go deeper into Goal values in another post. Sign up to our newsletter below 👇 to make sure you don’t miss it. You can link a funnel to your Goal, but it won’t be used to calculate your goal conversion rate. It will only be visible from the Funnel conversion section. The URL you’ll need to provide will be in the same format as your Destination URL (e.g. Equals to, Begins with or Regular expression), and the funnel won’t impact your Goal conversion rate. You can test and refine the filtering of your Goals with this feature. Once you’ve setup your first Goals, you’ll have to wait for it to get relevant data. Depending on your site traffic, this can take anywhere between a day and a few weeks. You’ll be able to analyze Goal performance directly from the Google Analytics interface. 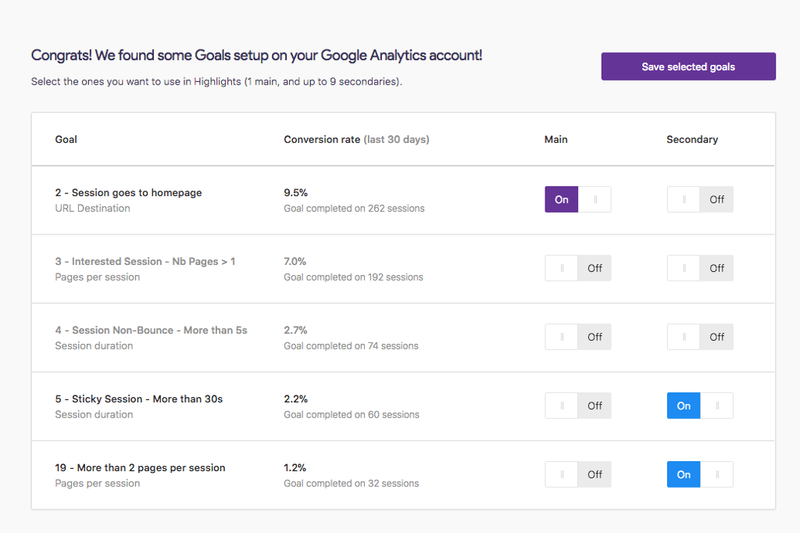 The ‘Overview’ section under ‘Conversions’ (Conversions > Goals > Overview) will show the conversion rates of your Goals, and their evolution over time. To evaluate the effectiveness of your landing pages in driving the right behaviors on your site, you can use the ‘Landing Pages’ report (Behavior > Site Content > Landing Pages). On the right of the table, you can select the Goal you want to analyze. You’ll be able to see the Goal completion rate and the number of completions per entry point. Be careful when analyzing Goal data. A page can have a high conversion rate, but low traffic. You can double-check that with the completion count. To get a clear picture of the performance of your landing pages, find the pages that convert the most for your primary goal, and also the pages that convert for your supporting goals, but not necessarily for your primary goal. You’ll want to send more traffic to the pages that convert the most, and fix the funnel for the pages that don’t. 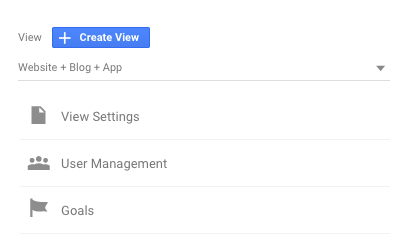 Another option to get that data is to connect your Google Analytics account to Highlights. 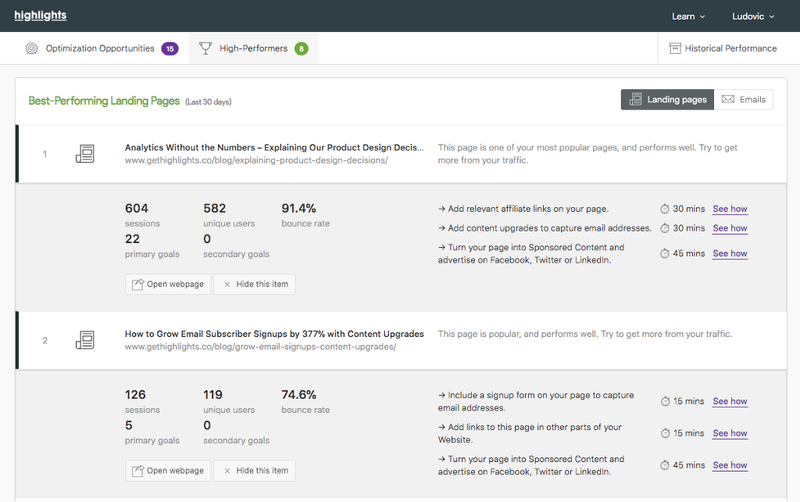 In just a few seconds, you’ll be able to analyze your site and landing pages using the Goals you just configured. There’s a lot of ways to reach your business goals, but accessing the right data shouldn’t hold you back. We’re building Highlights to help everyone use data. 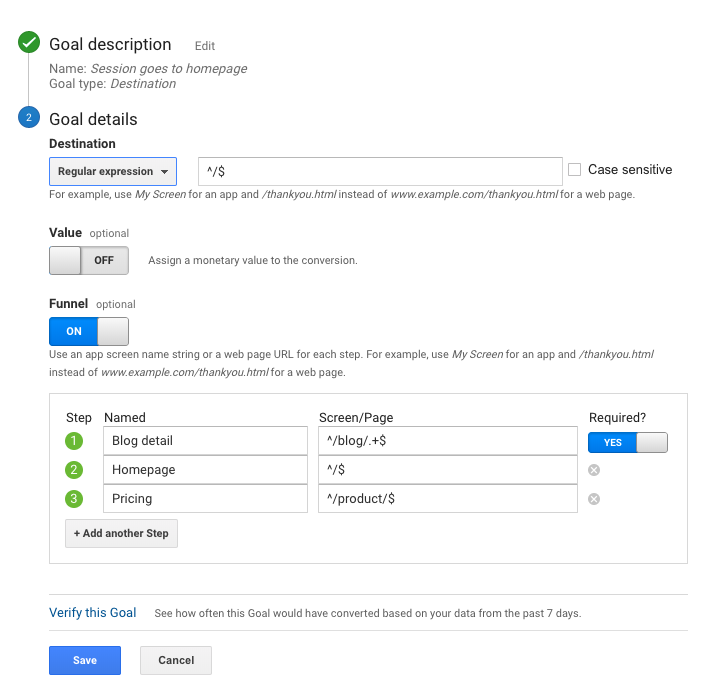 How to Setup and Use Google Analytics Goals to Grow Your Business was originally published in Marketing And Growth Hacking on Medium, where people are continuing the conversation by highlighting and responding to this story.